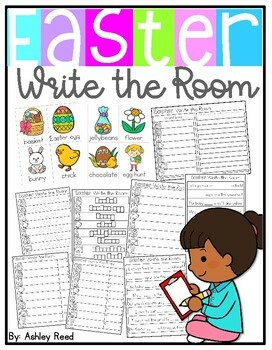 Write the Room is a fun way to get kids moving as they learn. 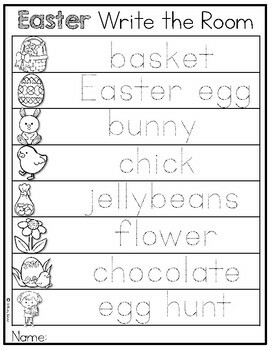 It's perfect for centers and is a great way to introduce seasonal or thematic vocabulary. But what works for one kid won't work for another. That's where this DIFFERENTIATED version of Write the Room comes in! 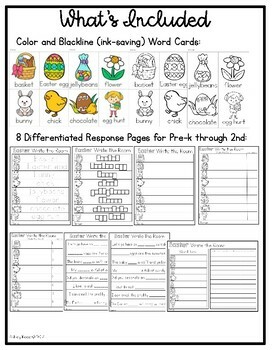 Included are 8 thematic words cards for the Easter (in a color version as well as a black and white ink-saving version!). Also included are 8 Differentiated Response Pages so each student can have fun doing "Write the Room" while working at their unique level. 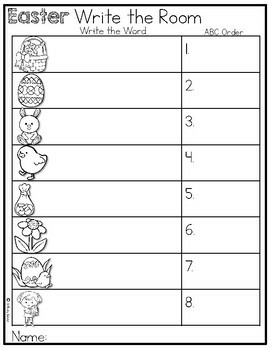 Your Pre-K through 2nd Grade Students will LOVE this fun activity and won't even realize they're practicing skills! Look for more thematic sets to be added periodically!